This project will investigate the effects of cooperation on rates of ageing in a wild cooperative bird, and the roles that telomere attrition and immunosenescence play in mediating such declines in performance. The student will join the large and dynamic Centre for Ecology & Conservation at our Cornwall campus and conduct fieldwork on sparrow weaver societies in the Kalahari desert. The causes of individual variation in ageing rates and the mechanisms that mediate such deterioration are priority areas for research in evolutionary and medical biology. Remarkably though, the extent to which an individual's social environment influences their ageing rate remains largely unexplored, despite evidence that the social context can profoundly impact reproductive effort (a key source of the damage to which the body is exposed). This project will investigate the causes of variation in ageing rates in a wild cooperative bird, the white-browed sparrow weaver, whose unusual breeding system yields marked variation in reproductive effort. Reproduction is monopolised by a dominant pair, who are assisted by variable numbers of non-breeding helpers who lighten the workloads of breeders. The project will therefore investigate the impact of breeding, helping and being helped upon rates of telomere attrition (a mediator of age-related cell death) and immunosenescence in the wild, and whether these in turn predict age-related declines in performance (reproductive investment, success and song complexity). The candidate will join a thriving group conducting evolutionary and mechanistic research on wild social vertebrates and gain valuable training in avian fieldwork skills, genetic and immunological laboratory techniques and statistical modelling. The project will be supervised by Drs Andy Young and Camille Bonneaud; specialists in vertebrate societies and wild immunology. For more information on the research group and project see here. How to apply: follow the PhD studentship link from here. Previous news item about this research. 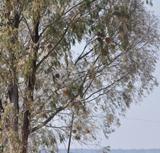 Field work at Tswalu - see here (scroll down to sparrow weaver photos). 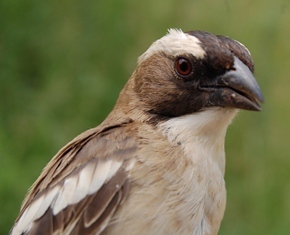 Oldest White-browed Sparrow Weaver - see here.